The Chase Ink Business Cash credit card currently has an Informr score of 8.8 out of 10. This score is based on our evaluation of 25 sources including reviews from users and the web's most trusted critics. 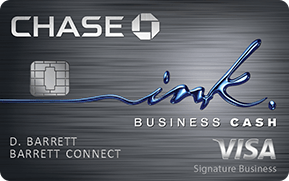 Chase Ink Business Cash credit card is typically available to those with excellent credit scores (650 or greater). No annual fee, flexible reward redemptions, and a great 0% APR purchase promotion are all standout features. The high sign-up bonus threshold, high balance transfer fee, relatively low 5% and 2% category spending caps, and high foreign transaction fees are all negatives. If you’re determined to keep costs to a minimum, the Chase Ink Business Cash card offers a lot of cash back on your business purchases — including purchases made on employee cards — for no annual fee. If you need a 0% APR promotion and want a high rewards rate on office supplies and certain utility purchases, the Chase Ink Cash Credit Card is tough to beat. However, the card’s cap on bonus rewards and low base rewards rate may lead you to look elsewhere. A great card to add to your collection. With incredibly high rewards to be earned, any small business owner would benefit from the perks. The best part of this card is that no matter what you earn, there is no annual fee to pay! So all of your earnings come without any penalty. With such generous cash back options along with travel and shopping benefits, it is one of the best business credit cards around. In combined purchases at gas stations and restaurants. In combined purchases at office supply stores and on cellular phone, landline, internet and cable TV services. With a $0 annual fee and a sign-up bonus worth $500, this card is a good fit for any business that spends significant money on office supplies and telecom services. There’s a reason we named the Ink Business Cash Credit Card the best business credit card for big expenses this year. Not only does this card offer a large signup bonus, but you get up to 5% cash-back on purchases made in certain business-related categories. There’s also no annual fee and no additional fees for employee cards. Finally, cardholders get 0% intro APR on purchases and balance transfers for the first 12 months of card ownership along with an array of other perks. If you’re a small business owner — or even if you do some contract or freelance work on the side — this card could be a nice fit in your wallet. It’s combination of simplicity and rewards value make it a good fit for anyone looking for a return without much hassle. This no-annual-fee business card from Chase can work well for small businesses looking to earn cash back on office supplies, business services and more every year. But if your business spends more than $25,000 each year, you might want to look at other alternatives.